The journey to the small island of Kampung Pantai Suri is a 20 minutes boat ride. The village sits at the estuary of the Kelantan River near Tumpat, and is near the South China Sea. Get a glimpse of the life of the villagers’, most of whom are fishermen, as they go out to sea early in the morning. There are no cars here, only motorcycles and bicycles. Most villagers prefer to walk as the homes are situated closely to one another. As you walk, feel the sand under your feet. 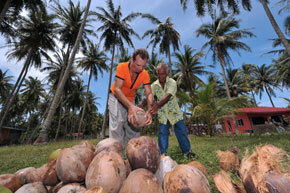 The coconut trees’ swaying gently in the wind and everyone knows everyone in the village of 450 people. 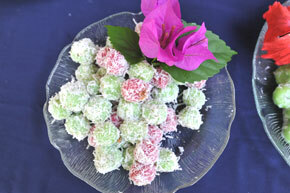 Try a hand at making the crunchy kuih sepit (love letters), or savour the tasty and mouth-watering local delicacy, kerabu nipah (palm salad) and play congkak with locals. Watch too, bees’ fly aimlessly, stopping from flower to flower, as ciku trees start to bear fruits. Roosters walk majestically in the village, watching the village ducks wrestling for a morsel or two. Dried fish is laid out to dry under the hot sun, to make salted fish. Friendly cats warm up to you as you stroll by. A bicycle lies unattended besides the withered bamboo fence. Life is simple, and this is Pantai Suri at its best.